Last weekend I attended the N9 Hackathon in Vienna. Nokia kindly sponsored all food and accommodation costs and, at the very end, surprised me with an entirely unexpected gift of a N9 phone. Vienna: great transportation system, delicious food (either that, or I was always extremely hungry when I ate), huge portions, restaurants open until midnight. Shame I didn't have time to see the city itself. The N9 is a gorgeous phone; much more so in real life than in pictures. After some hassle upgrading the Qt SDK (the provided upgrade tool managed to somehow remove the Qt Creator IDE while purporting to upgrade it; I had to reinstall the entire SDK) and flashing my N950 with Beta 2 firmware (Qt SDK 1.1.3 produces apps incompatible with the old Beta 1 firmware of the N950) I started prototyping a time tracking application in QML, while learning QML and the N9 design guidelines at the same time. 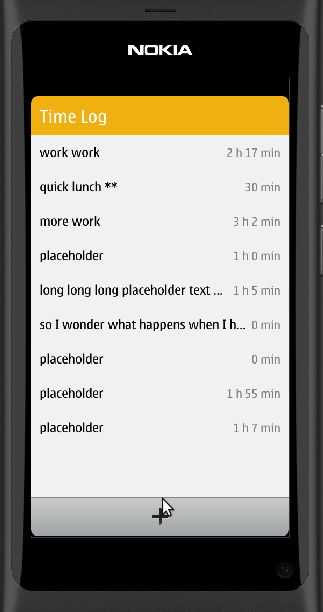 Converting the pretty pictures into QML was harder than I expected, but at the end of the second day I had something that looked like a native N9 application. The QML syntax introduction (which felt incomplete, but was almost adequate in the end). The list of Harmattan-specific QML components. The list of standard QML components. The UI building blocks pages mentioned above (pretty pictures! pretty colours! I like shiny things!). The TutorialApplication sample, finding the sources of which was unexpectedly difficult -- a straight git clone of the qt-components repository gives you something too recent to run with the older qt-components version on the N9. I ended up using apt-get source qt-components in Scratchbox to download the source tarball of version 1.0~git20110525-1+0m6. 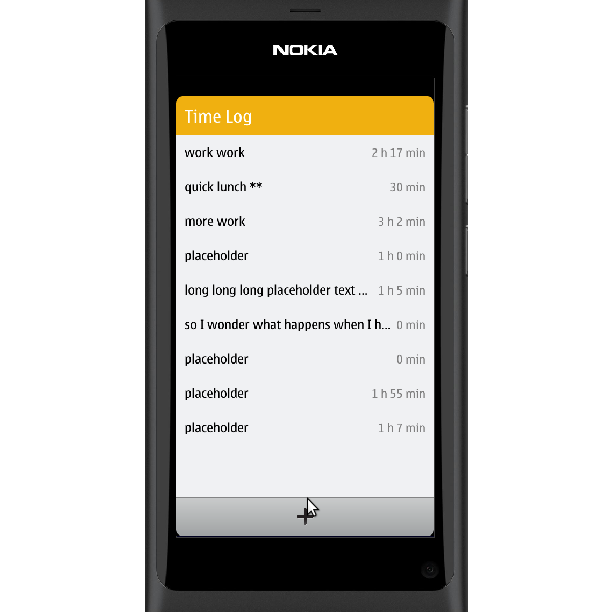 Look in qt-components/examples/meego/. Finally, workflow. QML is parsed at run time (application startup time, unless you delay the loading), which means no recompilation ought to be required to make changes, which means short development feedback cycles ought to be possible. So I was not happy about having to wait several seconds after hitting Run in Qt Creator, while it built a .deb, copied it to the device over wifi or USB networking, installed and ran it there. Deploying to the Qt Simulator is quicker, but not as much as I think it ought to be. Plus, the Qt Simulator apparently cannot simulate the landscape mode of the N9, and it lies about the default font size of QML Text elements (if you do not specify a pixelSize, text elements will look all right in the simulator, but ridiculously tiny on the N9). Oh, and my code is up on Github.